Journalism does not create democracy and democracy does not invent journalism, but what is the relationship between them? This question is at the heart of this book by world renowned sociologist and media scholar Michael Schudson. Focusing on the U.S. media but seeing them in a comparative context, Schudson brings his understanding of news as at once a story-telling and fact-centered practice to bear on a variety of controversies about what public knowledge today is and what it should be. Should experts have a role in governing democracies? Is news melodramatic or is it ironic – or is it both at different times? In the title essay, Schudson even suggests that journalism serves the interests of free expression and democracy best when it least lives up to the demands of media critics for deep thought and analysis; passion for the sensational event may be news at its democratically most powerful. Lively, provocative, unconventional, and deeply informed by a rich understanding of journalism’s history, this work collects the best of Schudson’s recent writings, including several pieces published here for the first time. Michael Schudson is Distinguished Professor in the Department of Communication at the University of California, San Diego, and Professor of Communication at the Graduate School of Journalism, Columbia University. "Michael Schudson, among the best of the academic writers on the media, has seen in the raucousness and hype of newspapers a pearl beyond price: the instinct to create trouble for the establishment, the panjandrums - them." "Schudson brings to his analysis an equanimity often missing among media critics. Uniquely among scholars of contemporary media, he is well steeped in American history and the history of ideas. Schudson's key argument in his eloquent new book is that it is the everyday reporting by the press, often pedestrian, often of trivial occurrences, that holds the powerful to account and limits their power to control what the public knows." "There's been a publishing boom in recent years in volumes pursuing the special relationship between media and democracy. Many hit the mark, but few hit it so convincingly and enjoyably, and in so few pages, as Schudson's." "Schudson is the best writer on journalism I know." "In this sharp and engaging little book ... Michael Schudson has launched a debate that can lead to a normative theory of journalism's purpose in the era of the internet." 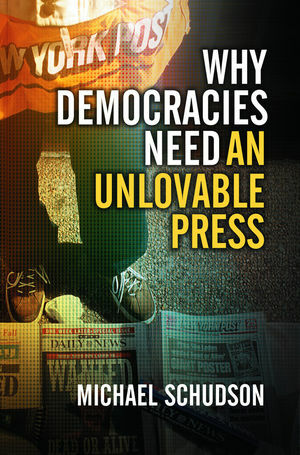 "A considered, fresh argument that points out often-overlooked contributions to democracy made by the unlovable press." "Schudson does an excellent job of pointing out that the press needs to be free to adequately provide the people with information that they need to form judgments about the government." "Makes a strong case for an independent press in a democracy, particularly the US." "Among contemporary American scholars working on media and politics, Michael Schudson is easily the wisest. This wonderful book shows why. Its case for thinking differently about journalism and democracy is compelling. There are pearls galore: wise remarks on subjects like the abuse of power, the functional necessity of truth, the decline of the newspaper, the rise of expertise, and the growing importance to democracy of efforts to monitor power publicly." "There are many reasons the press is unlovable, and irresponsible. Readers will find these enumerated in Michael Schudson’s important book. But readers will also find an eloquent argument about the vital role an independent press plays in a democracy, and why an 'annoying' journalist can advance the public interest just as surely as a President." "A sparkling set of essays on journalism and democracy by one of the world’s foremost media scholars. It alternates between defending the commonplace and attacking the holiest of sacred cows, making you want to rush to the next page of this brilliant, elegant and learned book." A major volume bringing together the writings of one of the world’s leading media scholars. Brings together some of Schudson’s most influential pieces of the past decade with some pieces previously unpublished in English and a significant new introduction which reflects on the major themes and directions of the work. Each of the pieces deals with the important and topical issue of the relationship between journalism and democracy. Will be of interest to scholars in the field, but the clarity and accessibility of the writings also ensure that this volume can be used in journalism/news/media classes.